The Deka Unigy I 12AVR75 Top Terminal Telcom Battery Series is designed specifically for long discharge telecommunications applications and are available as a 6 cell (12 Volt) monobloc battery. 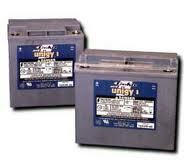 Deka Unigy I Telcom batteries deliver reliable power when conventional batteries might have already failed. Deka Unigy I Telcom batteries go through a series of over 250 stringent quality control checks and extensive testing to ensure the industry’s most accurate and dependable ratings.